Ideal for tired anglers to come and relax after your days fishing! 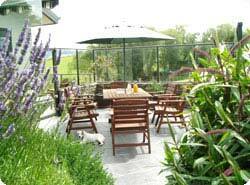 Wentworth Heights Bed & Breakfast accommodation is run by Diane & Barry Perkins and located in Gore, Southland, New Zealand. 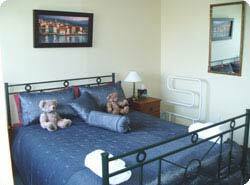 Diane & Barry's B & B features spectacular views of surrounding farmland, Hokonui Hills, Mataura River and Gore township, is situated on a 12 acre farmlet, with a few cattle, sheep and pet lambs in springtime - as mentioned in 'Rough Guide'. At the end of a day's guided fishing, come home to Wentworth Heights Bed & Breakfast and relax over a few drinks and finger food, while reliving the magical experience of fishing for hard fighting wild brown trout in the world famous Mataura River. The option of a 3 course dinner with New Zealand wines and beers is available to complete the evening. Diane and Barry welcome you to enjoy genuine Southern hospitality, or to make your stay as private as you wish. For breakfast serve yourself from our continental breakfast bar featuring a selection of cereals, fruits, yoghurt and juices. A selection of teas, freshly ground plunger coffee, toast and spreads will be served to your table. 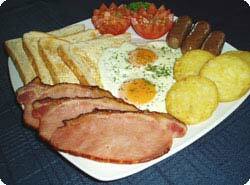 Guests may also choose from a 'Full Cooked Kiwi Breakfast'; Pancakes, fresh fruit & maple syrup; or Gourmet scrambled egg, tomato, bacon & avocado. Wentworth Heights B & B is only 2 minutes drive from the Mataura River - offering some of the best dry fly wild brown trout fishing in the world. "My father and I arrived at Wentworth Heights after a 13 hour flight, 4 hour layover and 2 hour drive from Dunedin to the feeling we were being greeted by good friends we’d just met. We were asked what we’d like to do after all that travelling; my father and I looked at each other, shrugged and said “why not?”. Less than an hour later we’d landed our first Mataura Browns to the boisterous “Well Fought! !” of our guide, Barry. Our stay with Barry and Diane couldn’t have been better. Each morning started with a more than generous breakfast and friendly conversation, and each evening finished with drinks in the family room and stories of our day of fishing. Our rooms, private en suites, were roomy, quiet and comfortable, more like staying at the home of a good friend than a lodge. On the days we fished on our own Barry made sure we had access to good fishing spots, a description of the fishing at each, and the right flies in hand. All this at a fraction of the cost of traditional fishing lodges. At the end of our stay Barry sent us off with directions to some of his favourite fishing holes throughout the South Island and pockets full of flies that worked well at each spot. In short, a fishing trip and stay with Barry and Diane is more than just a good value. It is superb by any standard, and we will certainly be returning." "It’s the complete 3G anglers package – Great guiding, Genuine hospitality and Gastronomically satisfying meals." "Friends ask me why I keep returning to Gore when there are so many other good places to fish in New Zealand. It is just such a great experience staying with Diane and Barry and fishing the Mataura River. Barry is an outstanding guide and has such an intimate knowledge of this magnificent river system with its large population of superbly conditioned brown trout. And you are spoilt for choice when it comes to fishing locations. There are just so many good river access points ranging from right in the town to just a short drive away: Vehicle access takes you almost to the water’s edge. Barry also has quite a few special spots on the properties of his farmer mates and these provide tremendous fishing not experienced by many other anglers visiting the region. After a day on the water it’s a real pleasure to come “home” relaxing, over nibbles and drinks, with Diane and Barry and discussing the day’s adventures and planning the next. And then there are Dianes delicious evening meals. It’s a real family environment." "Dear Barry, I just wanted to thank you for such a great time on the river we had with you. Everything was perfect from the lunch, scenery, company and the fishing itself. I still can’t believe how many fish you got us into and the quality of them! It is easy for a guide to just point the client in the right direction and let them get on with it but your knowledge, professionalism and love of the river shone through during the day and I know we would have never found that spot on our own! Your B+B was the perfect spot for us to crash after a hard days fishing and Diane cooked without a doubt the best breakfasts we had on our trip to the South Island. The rooms were perfect and the whole experience was awesome! Thank you both again." Pete Tyjas - Devon, U.K.